With over 30 years of carpentry experience, I Parkes Joinery has grown to be one of the most highly regarded joinery and bespoke kitchen makers in the area. All of our work reflects the finest in craftsmanship. I Parkes Joinery specialise in hand made, made to measure kitchens; the whole kitchen is made from scratch in our workshop using the best fittings and hardware available. We do not use ready-made cabinets or doors from other manufacturers; every cabinet, door and piece of trim is made to fit the space properly and the design is made just how you want it from the cabinet depth and height to the width of the door frame and moulding detail etc. Kitchens are made using any type of timber required with a range of finishes. Hand painted kitchens have become very popular and we offer any colour. We can even match door design, trim and colour to your chosen tiles or existing furniture. I Parkes Joinery are able to design, build and fully fit your bespoke kitchen a price that compares with most high street factory made kitchens. You will deal only with the person actually making and fitting your kitchen. Getting the perfect kitchen that actually fits your home doesn’t have to break the bank, we make a living not a killing! 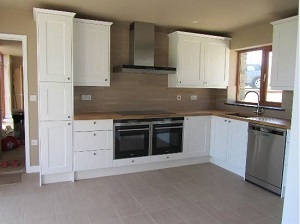 We not only offer complete kitchens, we can also refurbish existing kitchens. We are also happy supply for DIY fitting or painting for budget conscious or DIY enthusiasts. We also offer most kinds of joinery including windows, doors, mouldings and furniture. If you would like more information about our hand made kitchens or joinery, please don’t hesitate to call me on the phone number above or by filling out the form on the contact page. Based close to the Devon and Cornwall border, most of our work is in that area, however our kitchens can be found many hundreds of miles away and we are happy to travel.